There were a number of other game inspired platforms mentioned, including Duolingo, Race to the White House, Undergrad Life run by the Rochester Institute of Technology, a degree that has been structured using game-inspired principles run by Concordia university, a game-inspired professional development platform and 3D GameLab. Bron also stressed that being game-inspired is not necessarily synonymous with being digital. If game attributes are applied to a learning context, then it does not matter whether it is being done in the digital environment, or in the real environment. 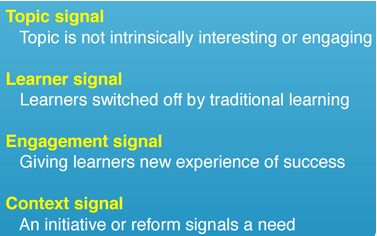 If any of those four signals are present, then utilising game-design, game-inspired or game-based learning may be a viable and productive option. There are, of course, some potential pitfalls to be aware of. At the end of the day, you are not building an actual game, you are creating a learning environment with some atoms or attributes of gaming, so it does not need to look and feel like a game necessarily. A few strategies that Bron has noticed increase the chances of successfully implementing game-inspired learning being a gamer yourself (I have that box ticked), leveraging your students current knowledge as to what they like in a game, and utilising platforms such as 3D GameLab to help build the learning structure. Following on from Bron, was Paul Hamilton, with a presentation titled Augmented Reality in Education. I’d had no experience at all with AR prior to hearing Paul talk, but what he showed me left me somewhat curious. I think that AR holds some potential, but that you would need a significant amount of professional development to effectively implement it. Paul indicated that he also utilises QR codes as part of the AR process as these are easier for students to utilise than hyperlinks written on a board, but that anecdotal evidence indicates greater learning retention and application from utilising the AR as opposed to the QR codes. Paul also listed some of the apps that he recommends using for AR plannign and programming, including Aurasma, Daqri, Layar and Blippar, as well as plugged his book, Augmented Reality in Education, which is available, free, in the iBookstore. The next article will cover the Breakout and Round table sessions, which went until lunch, and maybe some observations from the expo itself. Thank you for reading, and as always, please leave a comment. I’d particularly love to hear if anyone has any experience with AR and/or Minecraft in the classroom. Posted on March 21, 2015 March 18, 2015 by Brendan MitchellPosted in EduTech, FutureSchoolsTagged 21st century learning, AR, Augmented Reality, Bron Stuckey, ClassTech, Digital Learner, education, EduTech, FutureSchools, Game Inspired Learning, Minecraft, Paul Hamilton, pedagogy. Next Next post: FutureSchools ClassTech Conference Review. Day 2 Session 2 – Stop! It’s roundtable time! Awesome stuff! Great write-up and thanks for listing some of the resources mentioned in your sessions, well worth a look I think.